2017 Big Ten Club Person of the Year (L-R) Bill Nesnidal from the I Fund, Lisa Winger, LA Illini club leader, and Big Ten Club president, Illinois Alumnus Rashard Mendenhall and Brian Harris Big Ten Club past president and Illinois alumnus. 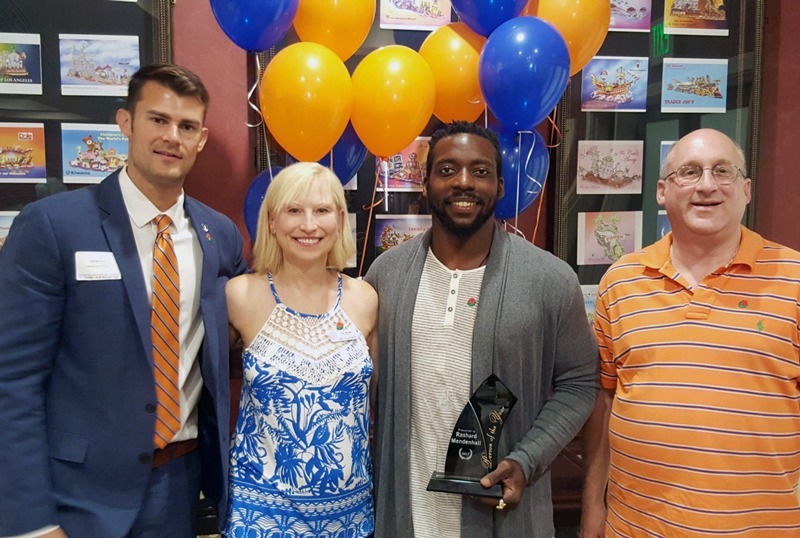 On Saturday, June 24 at the Pasadena Tournment of Roses house, Illini Alumni, Big Ten Club members and friends gathered to honor one of Illinois’ outstanding alumni Rashard Mendenhall as the 2017 Big Ten Person of the Year. Since I am the president of the Big Ten Club this year, I had the opportunity to select the recipient for this prestegious award. Past recipients have been Kirk Herbstreit, Drew Brees, Bob Miller, Tommy Lasorda, John Wooden, Keith Jackson, Bob Hope, and many more. Rashard’s accomplishments both on and off the field made him an outstanding person to be the 2017 BTC Person of the Year. “Ballers“ stars Dwayne “The Rock” Johnson, who plays an ex-NFL player turned agent. The show has been largely compared the HBO series Entourage. It was truly an amazing afternoon and an honor to meet Rashard and present him with this award. We were also treated to a viewing of the trailer for Rashard’s documentary about one of his former Steeler teammates coming out this Fall “The Hustler Sizzle”. You can view a trailer here.